Over the past 12-18 months — as our family has tried to eat significantly more fresh produce — I’ve been asked over and over and over again how I make this work without going back to the grocery store every other day. Well, believe it or not, I often only get groceries every 2 to 3 weeks! 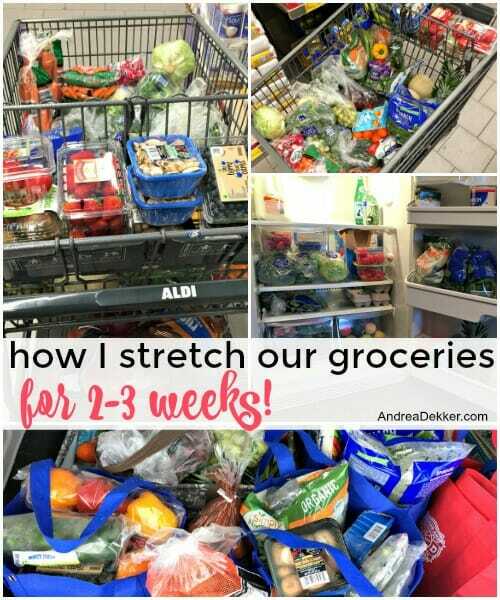 So how do I stretch our produce and other perishable items for 2-3 weeks? 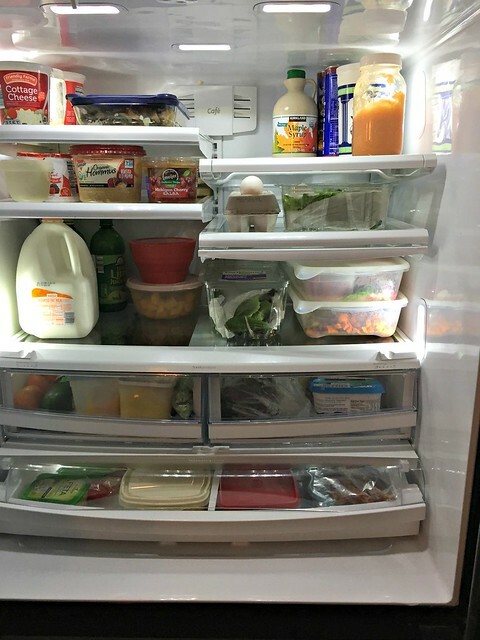 My simple answer: We have an extra refrigerator, and we eat a huge variety! Obviously, if I’m going to buy 2-3 weeks worth of fresh fruits and veggies for our family of 6 (and many guests), we NEED extra cold storage in order to keep everything fresh. Thankfully, we’ve had an extra refrigerator ever since we finished our kitchen renovation back in 2012! This baby is getting old, but it has come in handy for hosting parties, holiday gatherings, storing extra garden surplus, and stock-piling 2-3 weeks worth of produce, dairy, eggs, etc. when I get back from my huge grocery haul! This allows us plenty of space in our kitchen refrigerator for the fruits and veggies we’ll use in the next 36-48 hours — along with various leftovers, meats, cheese, snacks, beverages, condiments, and foods I have already prepared for upcoming meals. Both refrigerators are STUFFED full after unpacking the groceries; and they are both VERY empty by the time I’m ready to head back to the store again. We also have “cold storage” in our basement. This is where we store potatoes, sweet potatoes, onions, squash, apples, etc. It’s especially cold in the winter months! Along with having an extra refrigerator, I make a point to prepare and serve our produce in order from “most perishable” to “least perishable” — assuring we eat a large variety of produce AND that our produce doesn’t go bad before we have a chance to eat it. For example, we’ll start by eating berries, kiwi, grapes, bananas, cucumbers, tomatoes, beans, sliced mushrooms, spinach, arugula, etc. Then we’ll add in pineapple, oranges, melons, pomegranates, avocados, peas, peppers, zucchini, whole mushrooms, head lettuce, etc. As our stock pile starts to dwindle, we’ll rely more on apples, oranges, broccoli, cauliflower, beets, squash, kale, etc. Foods like onions, potatoes, sweet potatoes, carrots, celery, squash, apples, pineapple, melons, and even fresh herbs will keep for WEEKS if properly stored and kept cold. We eat these throughout the 3 weeks with no issues at all. And if we really run stuck, I always have my home-canned tomatoes as well as frozen corn and peas! IF the fresh produce looks like it’s starting to go bad, I immediately wash it, chop it up, and put it in the freezer. 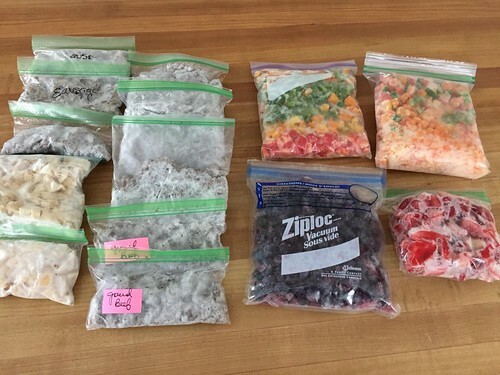 This does not happen all that often, but I have several zip-top bags in the freezer for bits of peppers, celery, zucchini, berries, bananas, apples, grapes, spinach, etc. We use these bits and pieces for breads, muffins, soups, quiche, and smoothies — produce is rarely ever wasted in our house and we end up eating a huge variety of different fruits, veggies, and greens! Here’s a look at what I buy to feed our family for roughly 2-3 weeks. 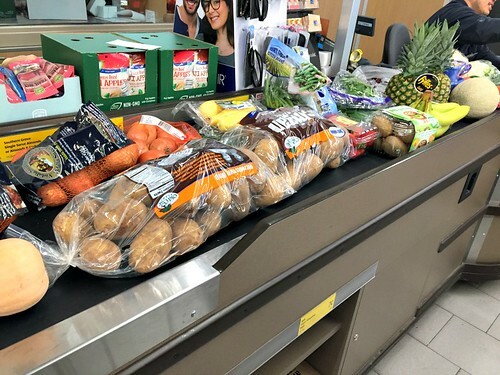 I’ve been asked countless times to share exactly what I buy from the grocery store — and while my grocery cart obviously looks different every trip (depending on what’s “on sale” and “in season”) this is a fairly accurate picture of what I buy and what we eat every couple of weeks. **We buy apples by the bushel from our local orchard from August through February. I also use these apples can our applesauce on a yearly basis. From March through July, I buy 6-10 pounds of store-bought apples in addition to everything listed below. green onions — a lot! **In the summer/fall, we grow tons of zucchini, squash, tomatoes, cherry tomatoes, beans, herbs, etc. so that helps to cut costs on produce from June/July through October! During the rest of the year, these are the veggies I buy almost every time I hit the grocery store. As I mentioned above, this is still an estimation. 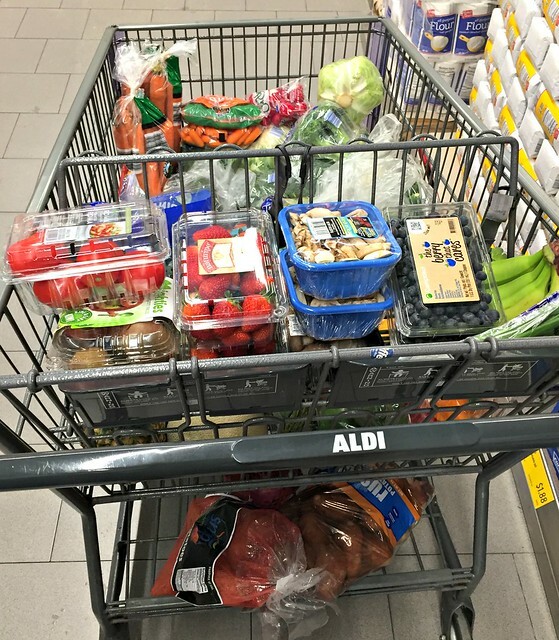 My Aldi bill is usually around $125 every 2-3 weeks for ALL that fresh produce — and produce is definitely the main thing I buy at Aldi. Sometimes I get yogurt or eggs if we’re running low. Other times I might buy a few condiments, baking supplies, or dried goods, but it’s mainly produce! 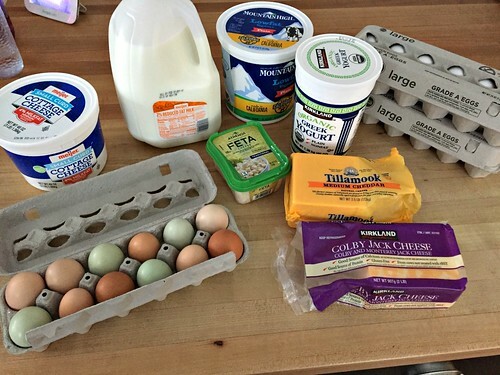 We buy a TON of dairy and eggs every month as well — you’d be surprised how long these items last. Eggs, milk, and cheese easily have long refrigerator life, so there is usually no need to head back to the store for more of any of these items. We’ve actually started buying a few dozen eggs each week from friends at church who now have more chickens and enough eggs to sell. However, I still need to supplement with store bought eggs as we often go through 6-12 eggs a day. I get almost all our dairy and eggs from Costco. I spend right around $200 at Costco every month — I try to go to Costco on a different week than I go to Aldi and I’ll pick up more tomatoes, cucumbers, and bananas if we need more. I also buy peanut butter, maple syrup, salsa, vitamins, toilet paper, and paper towels from Costco. To be perfectly honest, there isn’t much else I buy from the grocery store these days as I’m making our own bread and we’re still eating through our huge pantry and freezer stash of snacks, condiments, and meats. If I need something special, I just add it to my list and pick it up the next time I’m at a grocery store — but this is rare. I buy my household cleaning products, soaps, lotions, toiletries, diapers, wipes, etc. from Grove.co. They deliver to my house every month — it’s fantastic! I also place a large order with Country Life Natural Foods every 6 months or so. This is where I buy all my wheat berries, oats, beans, rice, legumes, seeds, dried fruit, spices, honey, etc. They have excellent bulk pricing and free delivery on large enough orders. Or, Dave and I will ask our parents to watch the kids while we drive the 45 minutes to pick up our order from the local Country Life store. We go out for lunch and it’s like a little grocery shopping ‘day date’! If we are in desperate need of something, we do have a small, more-expensive grocery store within walking distance of our house. 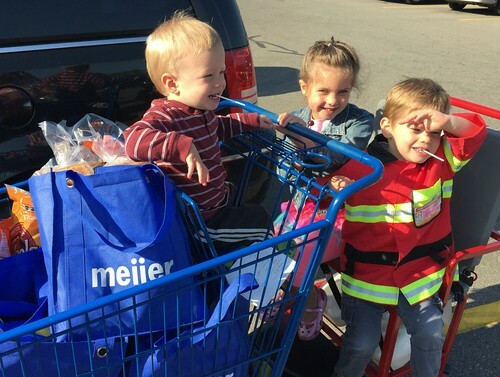 Ironically, they always have really good prices on eggs and bananas, so when the weather is nice, the kids and I will often walk or ride bikes to that store just for something to do. We’ll pick up a bunch of bananas, a couple dozen eggs, and maybe let the kids pick out a snack, and then we’ll ride home again! Beef: Dave’s parents have gifted us a quarter of a cow every other year, and that has been more than enough beef to cover our needs for 2 years. Pork, bacon, sausage, chicken, fish = I have gotten almost all our pork, bacon, sausage, chicken and fish from Zaycon Fresh (for free using referral credits) however, they are no longer in business so I will eventually need to start purchasing more of this. I had stocked up A LOT before they went out of business, so I’ll be good on meat for a while. Eventually, this will add more cost to my budget below, but for now, we have enjoyed spending very little money on meat! Lunch meat: We rarely buy lunch meat anymore, aside from a specific type of deli turkey for Dave’s sandwiches — this is factored into my monthly Meijer budget below. Summer sausage, pepperoni, hot dogs, and other “processed meats”: This is also factored into my Meijer and Costco budgets below — I just buy them as-needed or when they go on sale. If I did the various calculations correctly, this breaks down to ROUGHLY $110 – $175 per week on groceries. Of course, I don’t actually shop “weekly”. Some weeks I literally spend nothing on groceries and other weeks I’ll spend $350 or more — it just depends on the week, what stores I go to, and how long it’s been since I shopped last! Either way, I’m satisfied with that weekly estimate — especially considering the enormous amount of fresh produce I’m buying, and the fact that we regularly invite people over for dinner and make food to bring to others. As I mentioned above, this is not an exact science by any means. If there is a great sale on some type of produce, I’ll definitely buy more and we’ll eat that instead of other fruits and veggies (or I’ll put a bunch of it in the freezer for later). We also don’t need to buy as much produce in the summer and fall due to our garden — so our numbers are lower in the summer and higher in the winter. 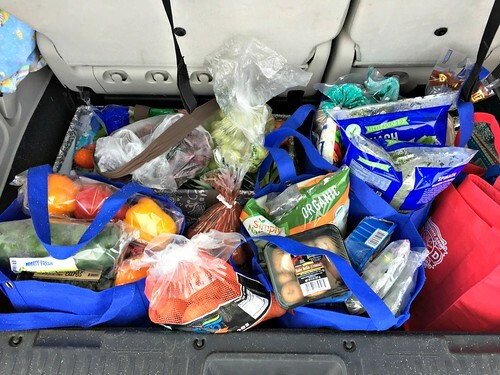 The point of this post is not to hem and haw over what a grocery budget should be for a family of 6 — it’s to show that if you are organized with how you prepare your foods (and if you have extra cold storage) it is VERY POSSIBLE to eat fresh foods without spending huge amounts of time shopping every other day (and without wasting food). 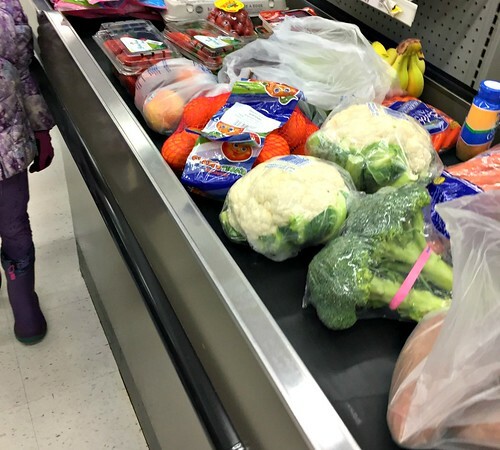 Believe me, I would not be able to stay on top of serving my family fresh fruits and veggies at every meal if it required multiple weekly grocery trips! 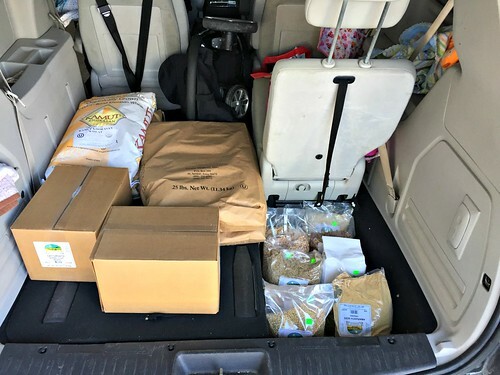 You know how much I hate grocery shopping — and this is just one more way I’ve managed to stretch out our trips to the store! And speaking of “serving my family fresh produce”… I’ll be back TOMORROW with a very long and detailed post of exactly how I store, prep, and serve all the produce I buy every 2-3 weeks! 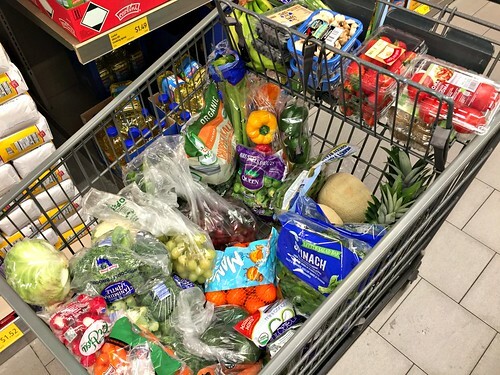 Want to read more about my grocery shopping over the years? Do you have any tips to stretch the time between trips to the grocery store? I also shop for two weeks at a time, and I’m really enjoying not frequenting the grocery store so much! There’s only two of us though so it’s easy. I’m impressed you can do this for a whole family! what I’ve found is that even if we are running low on produce, dairy, etc. we’ll just “make due” with what we have. If that means having some odd meals for a couple days, then so be it. It’s sometimes hard to not let myself “quick run to the store for a couple things”, but I know if I do that, I’ll end up buying more and spending a lot more too. So while I do try to buy enough for a full 2-3 weeks at a time, I also don’t mind needing to compromise and get “creative” in the kitchen for a few days as well. My second refrigerator recently died and the garage food storage is my one reason to be thankful for living in Nebraska in the winter! This is a great post. I feel like I need to come back to it later and comb through slowly- there is lots here! I feel like I could definitely do better as far as planning goes so I could shop less. And it’s funny, I was just telling my husband yesterday that we need a second fridge! 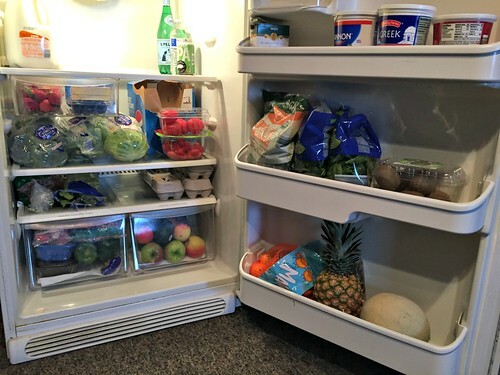 And yes, our second fridge has been a HUGE positive when it comes to grocery shopping, meal planning, entertaining, etc. I live 60 miles from a major grocery store although we have a small, more expense alternative in our town. I basically do the same as you for produce. We are currently on the market for a new main fridge and I am amazed at how small some of the produce drawers are in the fridges! Most people obviously don’t stock produce like us! wow — that’s a LOOOOONG trip to the store! I’d honestly be tempted to shop at the expensive store and save myself 2+ hours of driving. I’m sharing more details and more pictures in tomorrow’s post! I’d probably just buy everything else form Aldi, Meijer or Costco — depending on where I was shopping that week. I’ve been fortunate to get so much affiliate credit for things we’d need to buy on a weekly basis anyway! Hey Andrea, I don’t know if you have an Azure Standard drop near you but you should look into them! I just compared prices on hard red wheat and soft white wheat and Azure was significantly cheaper than Country Life on both! Those are the only two products I compared, but worth looking into. The one downside is they only ship once/month and you have to meet the truck. It’s worth it for us though! I’ve started using the silicone ReZip bags from Target to store my produce and freezer storage. I like them a lot. They wash up well in the dishwasher or by hand. They are an investment up front but I will save on Ziplocks in the long run, not to mention throwing away all those plastic bags. I did reuse as many as possible, but throwing them away st some point is inevitable. Andrea, did you address meat and fish expenses? How does this affect your budget? no I didn’t — but I just went back and updated the post to reflect this expense. Short story, we got much of it for free as I was part of a co-op that gave referral incentives for meat purchases and Dave’s parents have gifted us with a 1/4 of a cow a few times over the past several years! Thank you! I was just thinking last week about how much time I spend at grocery stores, and I would like to cut that time down. But my cart is full of fresh produce and I don’t want any to go to waste. Today’s post is excellent and I’m looking forward to tomorrow’s on keeping all of that produce fresh! it’s definitley a ‘learning curve’ and a different way of meal planning when I have SO much fresh produce to use appropriately before it goes bad, however I do it now without a second thought! And yes, I do save quite a bit of time by not grocery shopping multiple times a week! I’ve never had great luck with Aldi’s “soft” produce (mostly fruit, I guess). It seems to spoil quickly, at least faster than that I get from other stores. I always wondered whether is was that they buy slightly older produce to get it cheaper or their stocking methods. Maybe I should try it again… Or maybe my family just doesn’t eat it fast enough. Great post. I’m looking forward to tomorrows post about how you prep it all. you know — it might just be YOUR Aldi store. I absolutely REFUSED to shop at Aldi for years and years because the store closest to me had awful produce. However, exactly a year ago, a new Aldi location opened just a bit further away and it’s AMAZING! So open, clean, fresh. Their produce is fantastic (often better than Meijer) and so much less expensive! I have had some issues with purple grapes, but everything else has been so tasty and fresh. So… it’s probably not you, just your store! We tried all three Aldi within driving distance of us and had the same experience you did, Brenda. The produce at all three was hit or miss for any type of longevity – typically miss. Since I refuse to go shopping more than once per week, I buy my produce at the “regular” store. Our three close Aldi stores also has really high prices (often higher than the “regular” store by a fair amount), so I don’t find it worth it to shop there as a general rule. Andrea, thanks for this post! We buy a ton of produce and you’ve inspired me to do even better. I would love to know how you use/prepare your beets. That is one vegetable that mystifies me and, frankly, makes me squeamish. I just peel them, dice them, and roast them with my other veggies. It took me a few weeks to really start to enjoy them, but now I absolutely LOVE their sweet taste. They add so much flavor when mixed with other roasted veggies! I also like them raw — shredded into salads or coleslaw — but that’s a messy job! I eat beets almost every day. I make jar salads for work, and beets are usually the bottom layer. I slice and dice, and then cook them in the microwave, and let them cool before adding them to the jar. Also good roasted with other veg. And a delicious soup–a vegetarian variation on Russian borscht. Saute finely chopped onion, garlic, and green pepper, and chile flakes. Add cubed beets and potatoes (you can add chopped cabbage, too, but it gets slimy if you freeze it). Add dill, bay leaf, pepper, and salt, and enough water to make soup. Cook until the vegetables are soft. Add about 1/2 c vinegar after you take it off the heat–it’ll be sad and bland if you don’t. Puree if you like, and serve with sour cream. yes, yes, and yes! All of these ways sound yummy! I have beets almost every morning for breakfast (I know how ridiculous that sounds but I love them). They are so sweet and juicy, they pair excellent with other roasted veggies, fried eggs, toast, bacon, etc.